I have been looking for good art pieces for my apartment. Apartment Therapy has great examples of homes that use art decor to really bring the whole place to life. It has several examples of “smart art” rather than pretty art, which adds color to everything and yet gives a unified appearance to the whole apartment. 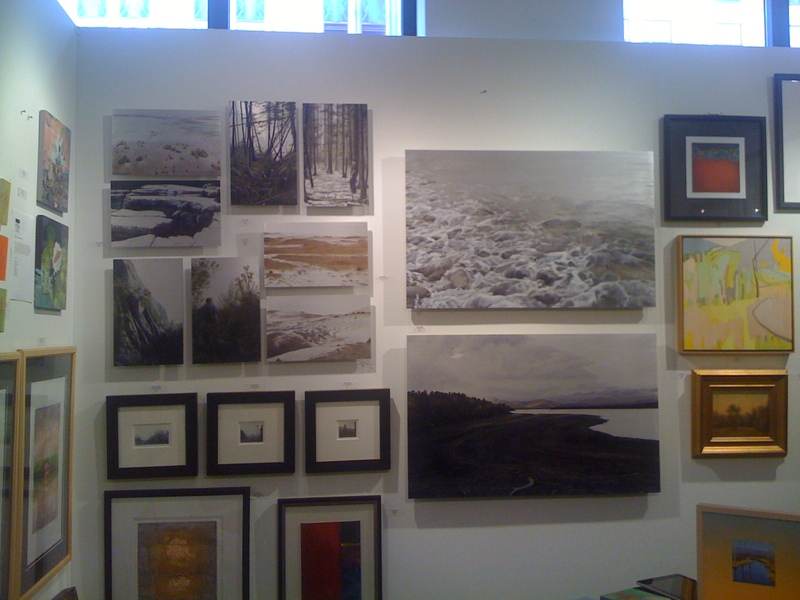 I visited the Affordable Art Fair today to look for such perfect pieces, and had a wonderful time. Some pieces really stood out. Art is very expensive, probably because if a single piece is sold artists have to be able to live off that. I saw a painting in India which cost a little over $2K, and I had a heart-attack at the thought of spending so much. But after today’s outing, that piece seems more reasonably priced. 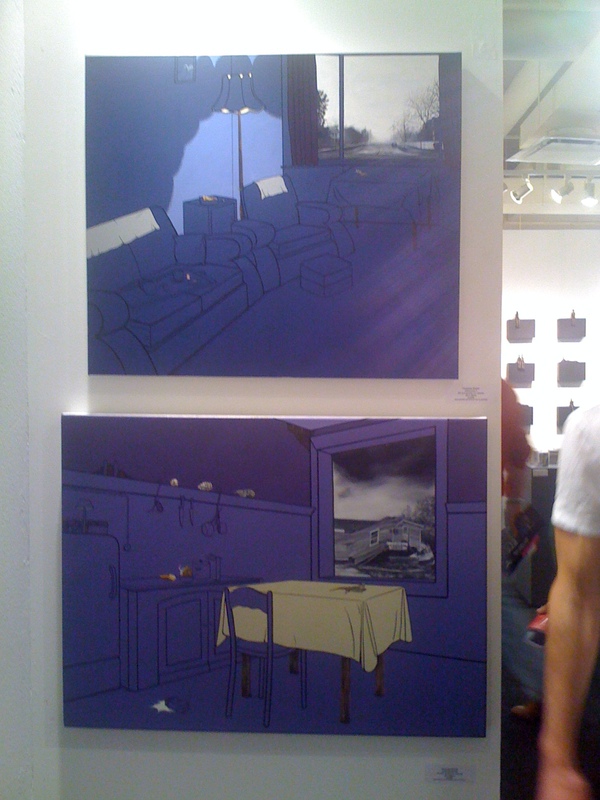 Today’s artwork was not really affordable; the affordable pieces were a lot smaller in size. The trend seems to be towards acrylic paint on aluminium. Strange choice, but the aluminium gives a totally different and realistic effect of sky and water. I will definitely have an aluminium painting in my place. Another trend is to have vertical and horizontal lines in different colors. Using a few of these together have an impact in adding color to a place, but in terms of actual art I find them lacking. I could easily draw lines in different colors all lined up and put it up in my apartment. Call me ignorant, but it doesn’t seem like hard work to me. Maybe the choice of colors has an impact, but really, do people pay thousands of dollars just for that? A third trend was to have dabs of colors to give shape to something, either a face, or people walking in rainy weather, or something. I found this interesting, but again why pay $$$$ for dabs of color when I could get a clear picture? My taste is more 20th century paintings with architectural effects and classics where the actual theme is clearly painted and you don’t have to guess. I learned to paint as a kid, and it is a lot of hard work! One of the teachers did not have hands, and he actually held the brushes in the toes of his feet – his paintings were breathtakingly beautiful! 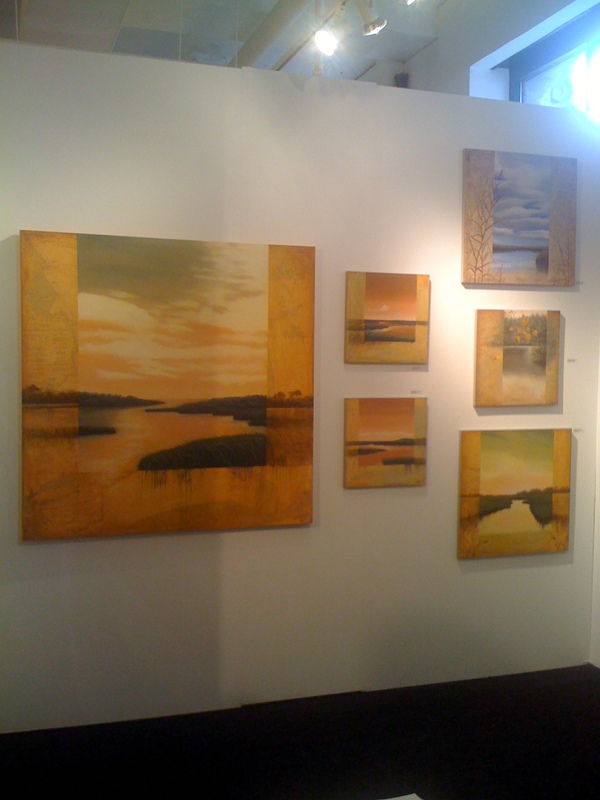 My favorite today was David Kessler with Myers Contemporary. His paintings were on aluminium – one was brushed a lot to give the effect of water, and there were others that were less brushed. Really gorgeous pieces, but cost $10K per painting!! 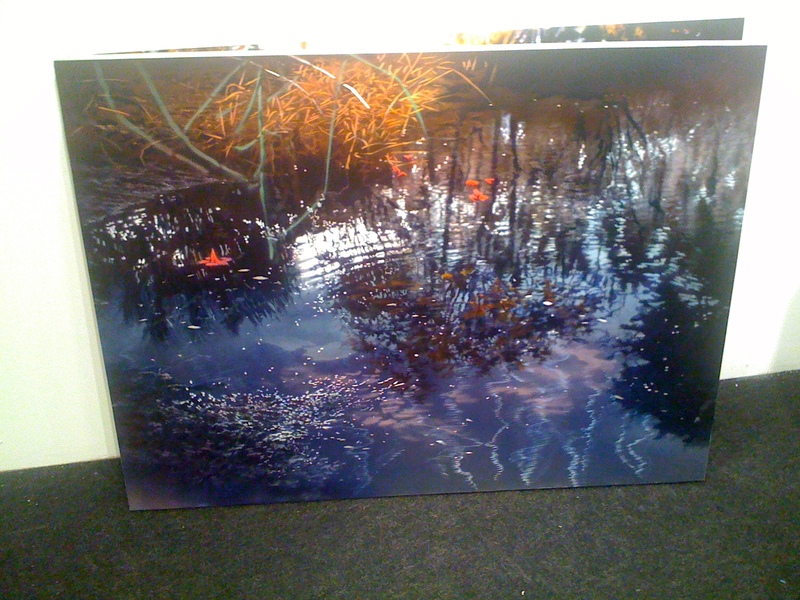 The paintings below are acrylic on aluminium, and the water effect at the bottom is brushed aluminium. As I moved to the side, the brushed part shone in the light. 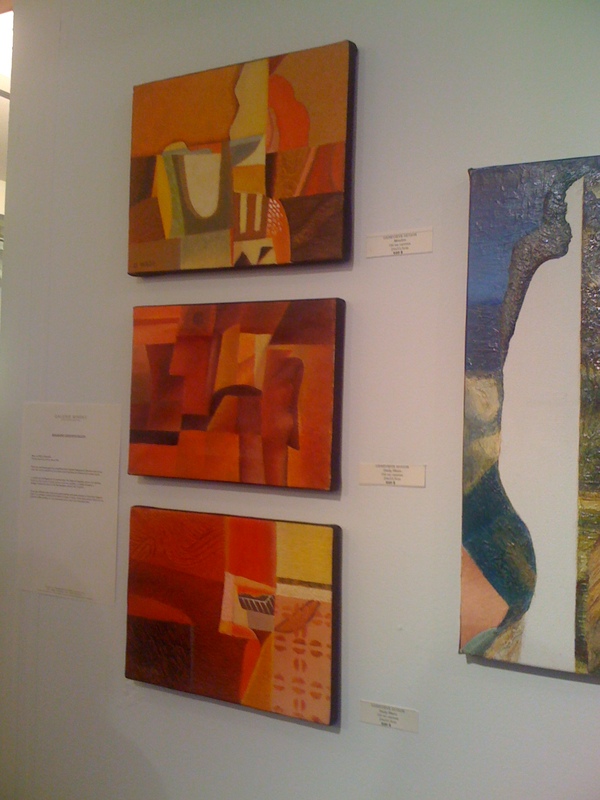 Another artist of interest is Suzanne Howes-Stevens. She literally does her paintings over maps, and the paintings represent that location. 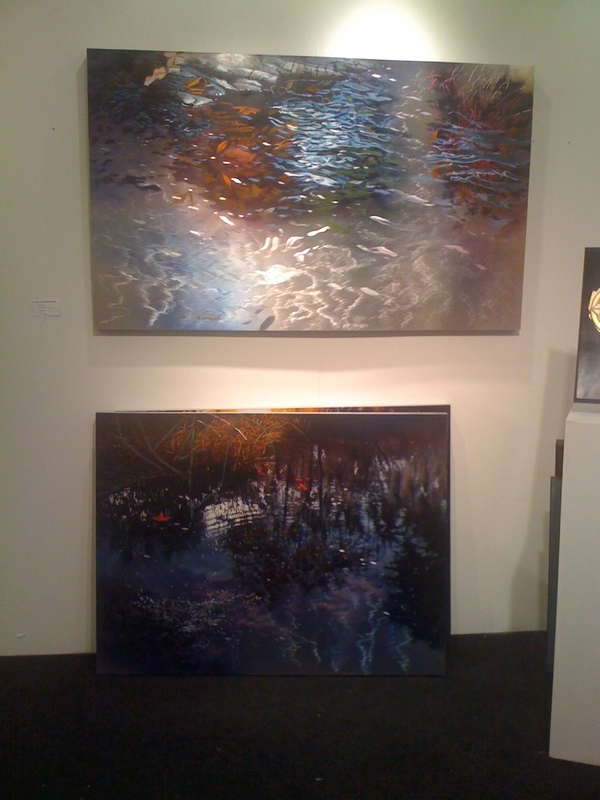 Lisa Lebofsky is another artist who paints on aluminium. Her paintings are quite pretty as well with trees, water, and sand, and aluminium as sky and water. In the photo below, eight on the top left corner and two large ones in the middle are all on aluminium. 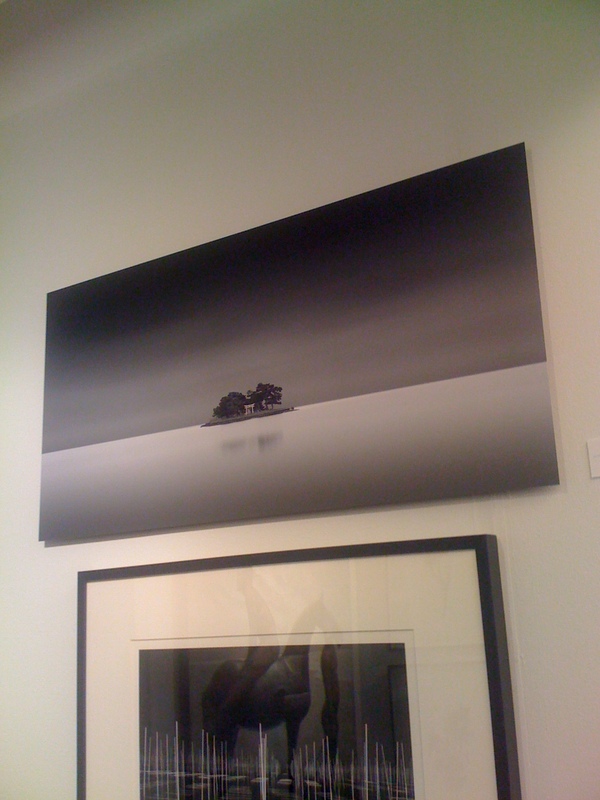 Another of my favorites was Michael Levin affiliated with The Weiss Gallery in Canada. His paintings were on aluminium as well, and most of them depict water. I looked at the painting below for a few minutes, and felt such an intense feeling of calm. I was quite overwhelmed and taken with it because it exuded such an intense sense of calm. I could not stop looking at it! The water reflection of the object is so subtle. I love his paintings – of all the paintings I saw today using aluminium, he has used it to the best effect because the shade of aluminium is natural and overpowers all other colors. I loved Philippe Jacquet as well. When I first saw his paintings, they seemed okay and yet I could not stop looking at them. I love the subtle use of colors and the greens. He was an architect and did painting as a hobby. Recently he started painting full-time. 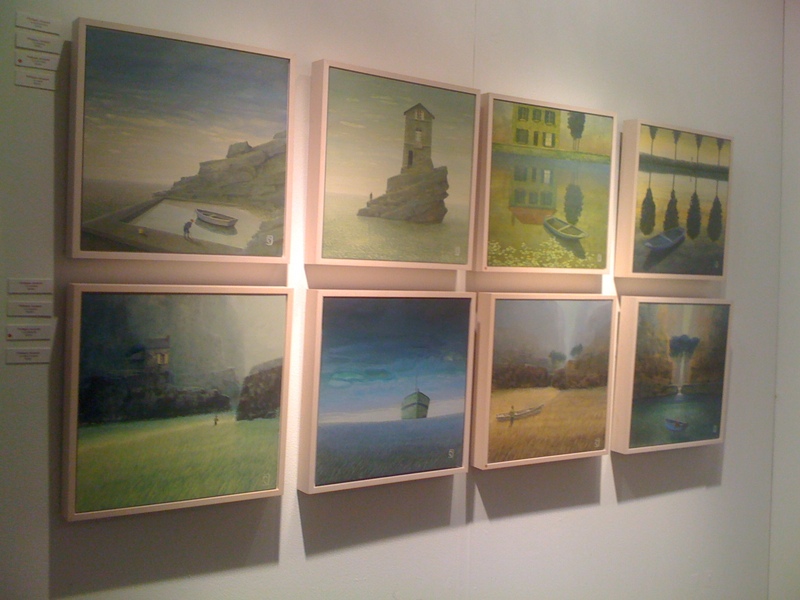 His paintings use mainly slate green with architectural elements such as buildings. He uses very subtle elements and colors – main objects (boat, man, building), even though small, stand out because the background is subtle. 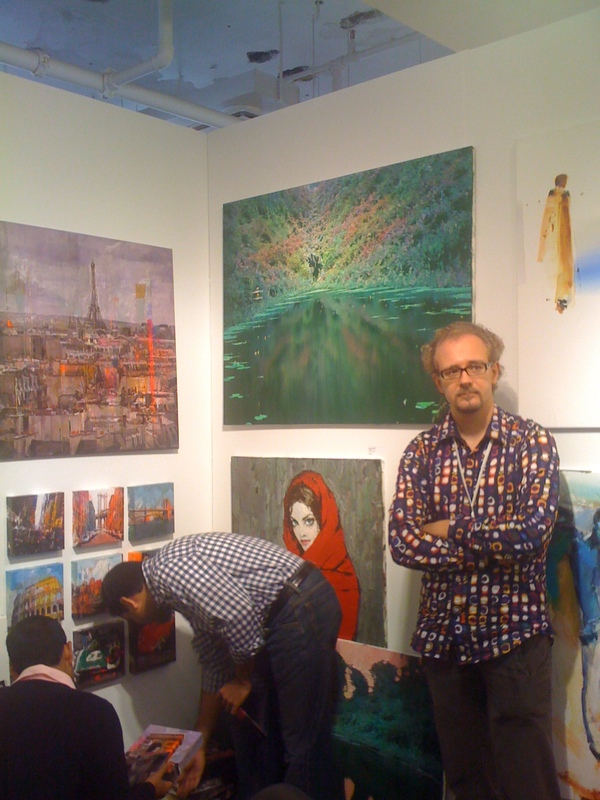 His paintings are an acquired taste – they don’t stand out right off the bat, but on close observation you understand his aesthetic and find a beauty in his colors. My favorite below is the second one with the building on a single rock. Another one that stood out is Marie-Elaine Lalonde. 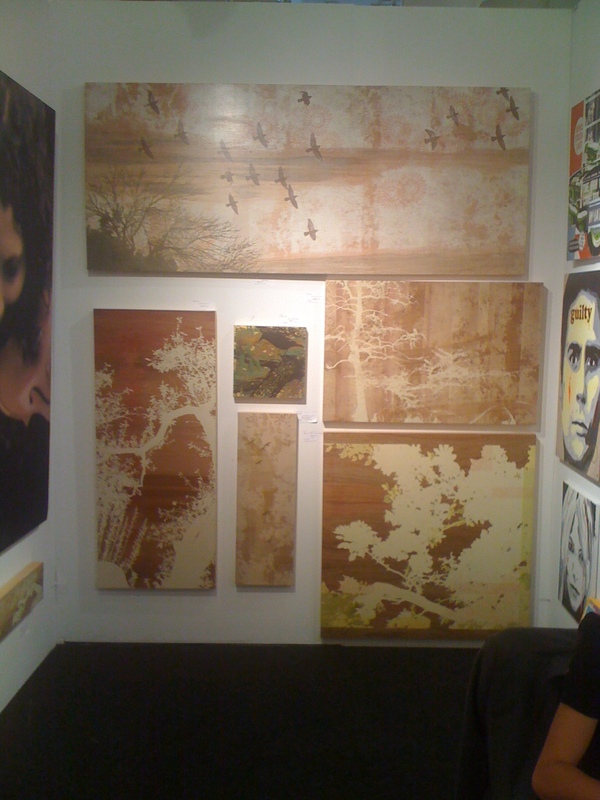 Her paintings are entirely on wood. The website says “silkscreening on wood” – I don’t know the technique. Her work was different. Another one to catch my eye was Vanessa Smith. I would probably put her paintings in a room with either the same dark color as her paintings so the interior depth in her work would stand out, or in a room with all walls in a lighter version than her work for her painting to stand out. What was different was that she used a single sharp color in the entire painting, different colors for some objects, and separate colors (primarily black and white sketches) on the exterior of the house as seen from the window. The layers added depth to her work. It was definitely eye-catching. At first glance it appears to be too dark and her work has a vintage look and feel, but it grows on you probably as a conversation piece. One artist used blood (real blood) which I found gross BTW and would never use in my apartment. It was just too disgusting and I could not appreciate the gothic “beauty”. The work was in a box-like structure. The front part of that box was transparent, and the blood was splattered in a sunburst look attached to the inside of the transparent piece. Another artist had very intense paintings. AM liked them, but I could not stand to look at them. They were too intense, deep, and negative. There was some guy being pulled by other beings around him, and he was stepping on some beings that were drowned or something. It wasn’t exactly a painting as much as a sketch in orange color. A lot of his paintings had a similar look and feel. He used a globe in one case, where countries were dark brown with cream veins. The veining itself was unpleasant. Below are a few others that I liked. I hope the guys doesn’t mind my posting their photo here – not my fault that they wouldn’t move while I was taking this pic.